Tours and Tasting by appointment only. The winery is housed in a repurposed nineteenth century barn where the interior is full of memorable details including light fixtures made from "historic barbed wire, life-size drawings of cowgirls on sliding blackboard doors and an unusual tasting 'bar'---a fallen slab of black walnut wood with naturally jagged edges as well as seating on burlap-covered hay bales. 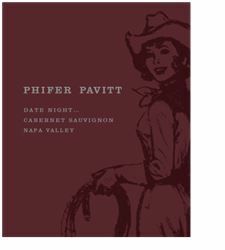 To join the wine club, visit www.phiferpavittwine.com or call 707-942-4787. Become a Verona Society Member! Inspired by the literally thousands of love letters written yearly to Juliet and the volunteers known as The Juliet Club who have answered those letters for more than 70 years. We cherish that romantic dedication and have bestowed the Verona Society honor to you, our case buyers, as an invitation to become part of the Phifer Pavitt DATENIGHT family. Your annual purchase of twelve bottles or more of Phifer Pavitt DATENIGHT Cabernet Sauvignon automatically qualifies you as a member of our special group of loyal supporters! Phifer Pavitt Wine is certified under the Napa Green Winery Program by the Napa County Department of Environmental Management (DEM) and the Association of Bay Area Government’s (ABAG) Green Business Program and completed all the regulatory components needed for environmental sustainability. These components included developing water and energy conservation methods, preventing pollution, and reducing solid waste. In addition to developing sustainable winery practices, this program is set to become the standard for the state of California. Phifer Pavitt Wine is certified under the Napa Green Certified Land Program. Phifer Pavitt Wine has created and implemented a customized farm plan with measured results that addressed all aspects of its property, vineyard land as well as non-farmed land, including practicing soil conservation, water conservation, stable drainage, riparian corridor enhancement, fisheries and wildlife habitat enhancement and long-term improvement and sustainability.